The UNC Family Medicine Summer Academy (UNC-FMSA) will begin accepting applications for its unique 3-day program beginning February 1st. The program targets graduating high school students from the state’s rural areas who are interested in medical careers and a rural service. 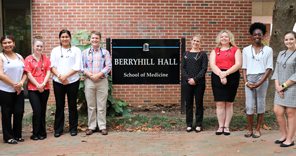 Scholars come to Chapel Hill during the summer for a 3-day immersion in Family Medicine on the UNC-Chapel Hill campus. Family physicians provide lectures on healthcare needs in NC and medical school requirements. The program is a partnership between the UNC Department of Family Medicine and the UNC School of Medicine Office of Rural Initiatives. NCAFP members from rural and underserved areas are encouraged to share this with their local high schools. Click here for complete information on the program, including a downloadable application.